Author A L Wright pens Fantasy, Paranormal and LGBT fiction. She spent most of her life writing, but only started to publish recently, in the last couple years. Her stories feature strong female characters and romantic undertones. Her style and prose have been described by reviewers as poetic, captivating and dark. Most of the books she has written are based on dreams she’s had and are further inspired by current culture and events. Ms. Wright is an Independent Author who was raised in a small Pacific NorthWest town of 900 people, but now lives in the South West desert, loves to ride motorcycles, and hopes to one day travel the world. She is published under imprint Noble Blood Books. Agent Colt Classified Pride: Colt Information Agency, Book 1 is a romantic suspense novel written by AL Wright. While she was sorry to lose Colonel Shelley King as her handler, Agent Tess Colt couldn't help but be a bit intrigued and excited by her new posting as a CIA agent in Venice, Italy. She'd be posing as a wealthy energy heiress, complete with sporty car, chauffeur, luxurious suite in a plush hotel, and an unlimited bank account. Her partner, Agent Isaiah Turelli, would be coming along with her, but his role would be somewhat different this time around. Colt's relationship with her flirty and sometimes superficial seeming partner had been getting increasingly strained of late. He saw her as cold and rigid, and she felt bad about that. But she had a secret to protect and feared that coming out on her job would affect the kind of work she'd be assigned and her future as a CIA agent. So, she maintained rigid control over herself until a petite young woman, who was assigned the seat next to her on the plane to Venice, broke through her icy resolve and began a campaign to steal Tess’s heart. AL Wright's contemporary romance novel, Agent Colt Classified Pride: Colt Information Agency, Book 1, introduces Tess Colt, a dedicated CIA agent whose professional and personal lives are at odds, or are they? Tess's concerns seem well justified even now, despite the increased attitude of acceptance towards lesbians, gays, and transgenders in today's culture. Will her handlers feel she can go undercover as a femme fatale for an assignment? Tess knows she can, and she's gone far in her field, but coming out seems a scary and irreversible process. I enjoyed reading Agent Colt Classified Pride and loved how the author incorporated an espionage plot into her romantic novel. Vaneesa, Tess, Isaiah, and even the taciturn Colonel Lyon, form the consummate professional team and watching them at work was a pleasure. Vaneesa and Tess's growing attraction is beautifully handled and the tension between them serves to both complement and intensify the suspense of the plot. 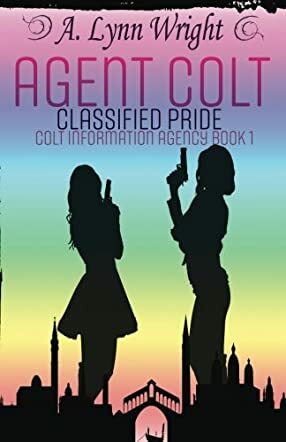 Agent Colt Classified Pride: Colt Information Agency, Book 1 is most highly recommended. Venice, Italy – with its stunning canals, hotels and views - is the gorgeous setting for CIA agent Tesse Colt’s new assignment. While undercover as an energy corporation’s wealthy heiress, she and her partner Isaiah Turelli connect with the elite of Venice, as well as with a new handler and agents within the CIA network. While Tesse works on developing a relationship with an illegal arms dealer, relationships with Isaiah and a beautiful CIA agent evolve into new personal challenges. Tesse and Isaiah’s partnership has experienced some strain recently, as Tesse has been guarded, keeping her personal life undercover too. The intrigue and excitement surrounding these plots make for a very interesting read in Agent Colt: Classified Pride (Colt Information Agency Book 1) by A.L. Wright. One of the best features of this novel is that while there are several simultaneous plots, it is easy to keep track of all the characters; the reader knows who the “bad guys” and the “good guys” are. Author A.L. Wright writes in a clear and concise manner. There is an excellent balance between descriptive prose and dialogue, thoughts and actions, and fun and danger. While the book is a relatively quick read, there is a great deal of character development and intrigue within it. The best news is that it is labeled as Book 1, meaning the story has just begun and readers can look forward to sequels! Agent Colt Classified Pride (Colt Information Agency Book 1) by AL Wright is a contemporary romance story. Latesse Colt is a secret agent. She is a super spy with an ace record, a male chauvinistic pig as a partner, and a secret – a dirty big secret that no-one else knows about. Until Latesse sinks one too many wines on a flight and spills it all to a complete stranger called Vaneesa. Latesse panics when she finds out that Vaneesa is the newest member of her team and wonders if her secret will stay that way. Latesse finds working with Vaneesa is both terrifying and thrilling but, at long last, Latesse can finally shed the mask that she hides behind. And, when she does, when she is no longer scared of the secret she has been hiding, it turns out that others have been hiding a secret too. Agent Colt Classified Pride (Colt Information Agency Book 1) by AL Wright is a well-paced story. It has plenty of go in it and quite a few little twists that take you off on different tangents, but all of which lead back to the same main story. The characters are well-written and likable, easy to identify with, and the whole story was easy to follow. It made for a relaxing read, not too taxing on the brain, but with sufficient guts to it to keep you hooked and reading. Lots of action, a bit of mystery, and a bit of romance thrown in for good measure make this an enjoyable and easy read. It's the type of story that will suit any reader looking for a diversion, something to sink into and forget about the world for a while.